The second memorial lecture in memory of Dr Chesmal Siriwardhana, organised by the Centre for Global Mental Health was held on the 21st June 2018 at the Institute of Psychiatry in London. Mr Leslie Dep, immediate past president of the association represented APSL at the event. 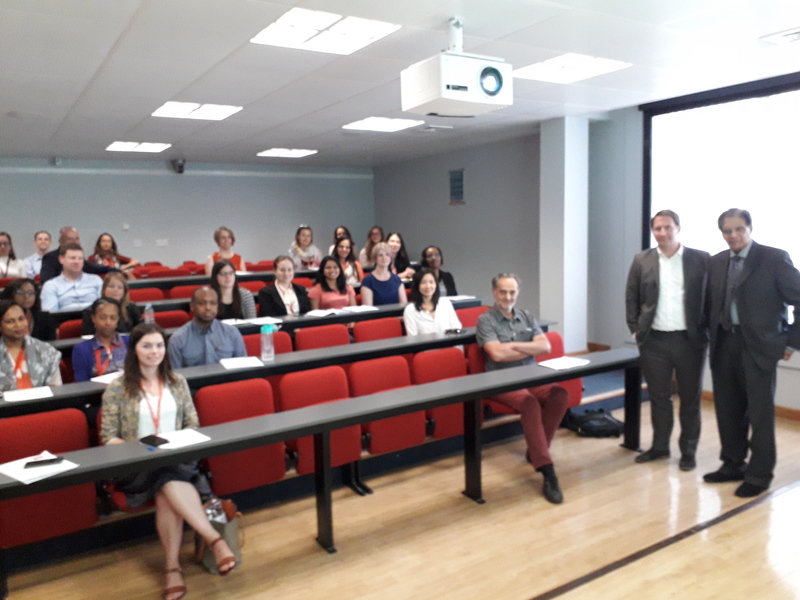 Prof. Bayard Roberts from the London School of Hygiene & Tropical Medicine gave the keynote address on “Research on mental health and psychosocial support in humanitarian settings – progress, gaps and opportunities”. Dr Roberts has visited Sri Lanka with Dr Chesmal and mentioned the work he carried out globally with Dr Chesmal. 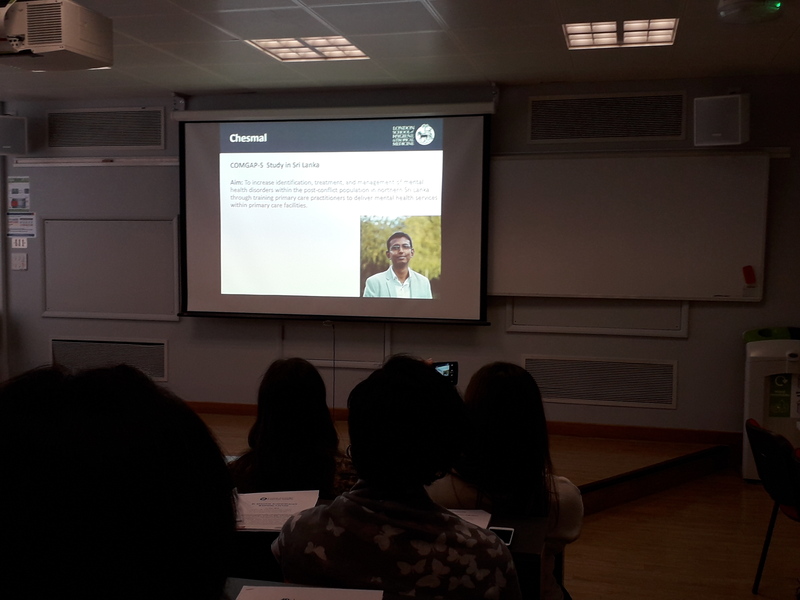 Dr Melanie Abbas gave a glowing tribute and a reflection of the work of Dr Chesmal Siriwardhana by remembering his time in IoPPN. There was a Q&A session chaired by Prof Ricardo Araya towards the end. Dr Chesmal was one of the vice presidents of the APSL and was serving as an Associate Professor at London school of Hygiene and Tropical Medicine at the time of his untimely demise. Dr Chesmal was a mental health expert who focused on migrants and people in armed conflict zones. He received his PhD in Psychiatric Epidemiology and his MSc from the Institute of Psychiatry, Psychology & Neuroscience, King’s College London. Dr Chesmal has completed his degree of Medicine (MD) from the Peoples’ Friendship University of Russia and Vitebski Dzjaržauny Medycynski Universitet. He was a very popular lecturer and inspired many students both in Sri Lanka and in United Kingdom with his work on global mental health. 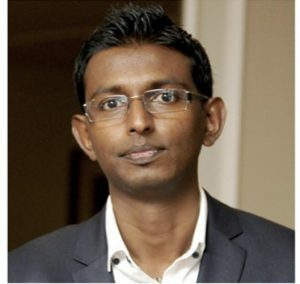 He was born on 6 June 1978 in Kurunegala District, Sri Lanka and suddenly passed away due to a traffic incident in London on 9 April 2017, aged 38 years. 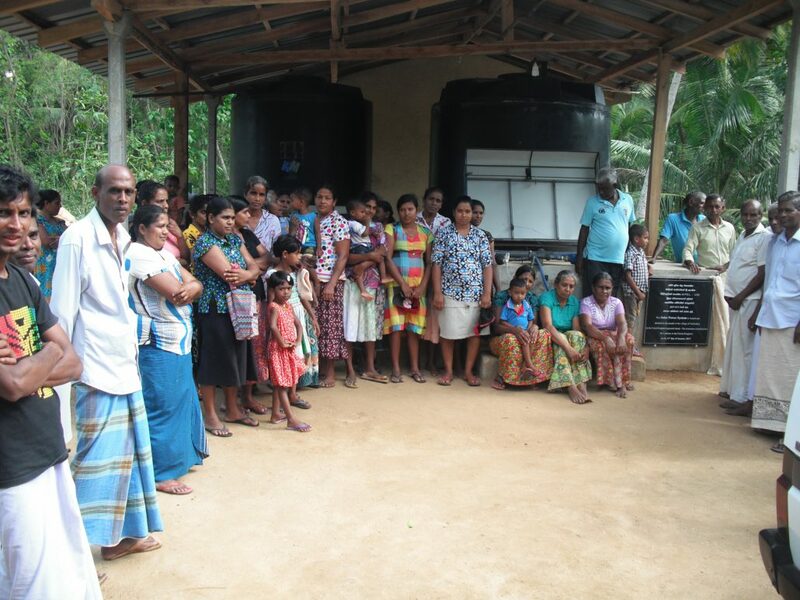 Success story of APSL Solar Village Concept, Sri Lanka. APSL Solar Village concept developed by APSL past President Prof. I. M. Dharmadasa focuses on the rural communities who are off the national grid or cannot afford commercially available alternatives, and trapped in poverty due to various reasons. In such a typical community, lighting comes from kerosene lamps and cooking is done with firewood. The project was developed so that rural communities will learn to help themselves in meeting their energy needs. The first stage of a large solar village project at Nochchiya village-cluster ”Nochchiya Solar village” situated in the Kurunegala district, Sri Lanka, was established in January 2017, with the installation of two solar power systems, each funded by UK registered charities – The Association of Professional Sri Lankans in the UK (APSL) and Hela Sarana. 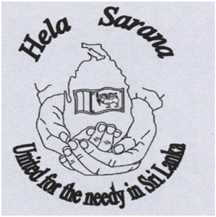 The Hela Sarana funded system was dedicated in memory of Mr Raja Meehitiya, the founder President of Hela Sarana who passed away in June 2015. 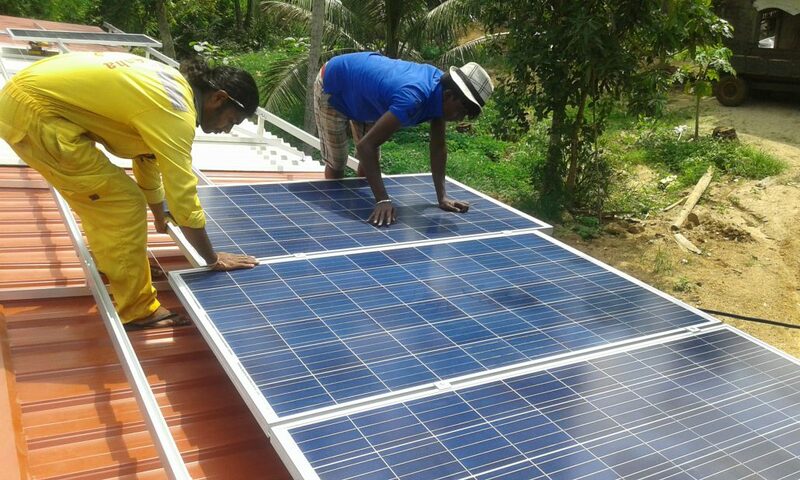 Following the opening of the first pilot solar village in 2008 at Kaduruwewa in the Kurunegala district, this will be the second large village cluster to replicate the solar village model in Sri Lanka. Solar village project concept was designed and developed by Professor I M Dharmadasa of Sheffield Hallam University, UK, in the late 1990s, during a Higher EducationLink programme, to empower rural communities using clean energy technologies for sustainable development and poverty alleviation. Poverty alleviation programmes in any community should have two main features; wealth creation method and follow-up methods for job creation within the community. The first stage in Nochchiya village will be provided by water pumping in the dry-zone using clean and freely available solar energy. Modifying the project features according to the requirements of the community, this new project at Nochchiya creates much-needed revenue to cover water pumping expenses within the village cluster. 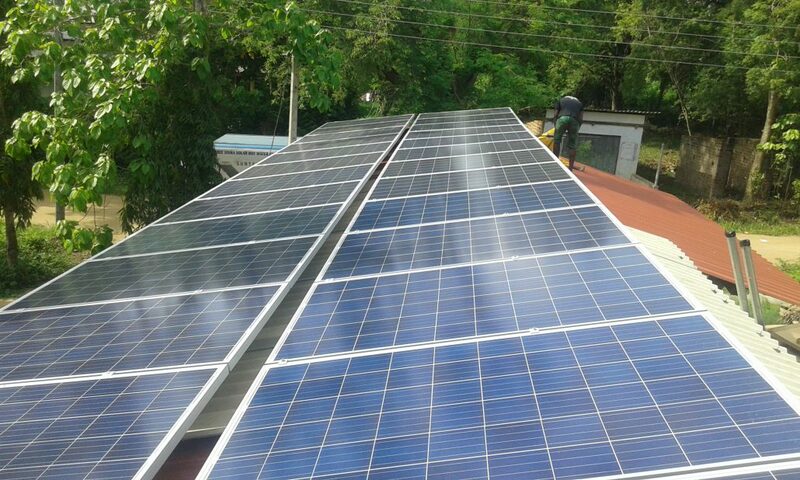 Two solar roofs of 3 kW each were installed in the village with the funding provided by the above two charities. The cost of each system was Rs 830,000 (£4.500), and the total cost was Rs 1.66 million (£9,000). The power produced from 6 kW solar roofs will be fed into the national grid, and the income generated will be used to cover the cost of two water pumping stations operated using grid electricity. These funds will be managed in a totally transparent way by the Village Development Committee with the guidance from project initiators. The project team will monitor the performance of the solar roofs over time and publish the data for the benefit of Sri Lankan solar initiative. This project also complements the Sri Lankan Government recently initiated “ONE Million” solar roof programme to produce clean energy by reducing the ‘important and burn’ of coal and diesel in Sri Lanka. The water pumped and purified is mainly used for drinking by the 1200 strong population this village, thereby reducing the risk of kidney and other water-borne diseases within the community. In addition, the surplus purified water is made available to seven other surrounding villages to purchase at a nominal cost. The project team within the APSL-UK is guiding the community to achieve rapid economic development by applying solar village concepts. This project also fulfils 13 out of 17 SDGs (Sustainable Development Goals) established by the United Nations. It is also highly relevant to Sri Lanka, supporting the promotion of the recently launched “Soorya Bala Sangramaya” (Battle for Solar Energy) programme, and helping to provide clean drinking water to the people in the region. This project can be a useful model for other developing countries closer to the equator, as a vehicle to support sustainable development, harnessing the power of the sun to overcome the detrimental effects of global warming. The Association of Professional Sri Lankans in the UK (APSL) celebrated the 2nd Anniversary of their Scholarship Scheme with a dinner dance at the Persian Suite, Royal Nawaab, Manchester, on Saturday 26 November 2016. The event was well attended by the sponsors of the children, many members of the APSL and their friends and well-wishers. The main purpose of the event was to thank the sponsors and express APSL’s gratitude for their support given to academically gifted children from poor families in Sri Lanka to continue their studies. The APSL Scholarship Scheme was launched in November 2014 based on a proposal made by Professor Terrance Fernando, Director of THINKLAB, University of Salford, UK (an executive committee member of APSL) to support the education of a group of children in the Moratuwa area of Sri Lanka. The scheme now provides scholarships to Thirty (30) children in several districts in Sri Lanka. Under the APSL Scholarship Scheme, the recipient children receive an initial bursary of Rs 5000 and thereafter Rs 3000 per month until they complete their G.C.E. (Advanced Level) examination. APSL regularly monitor the academic performance of the children. Mr Leslie Dep, President of APSL welcomed the sponsors and the other attendees and provided a brief overview of APSL and its projects. He commended Professor Terrance Fernando, Mr Mervyn Silva and the APSL education committee for the progress the Scholarship Scheme has made during the past two years. Professor Terrance Fernando in his speech, explained in detail the background and the reasons for initiating the APSL Scholarship Scheme. He said he felt the need to support the bright children from poor families in his hometown of Moratuwa by giving them a reasonable sum of money as a monthly grant, and with the support of the APSL as the facilitator he is very happy with the progress of the scheme. Mr Mervyn Silva, Immediate Past President of APSL and the Project Leader of the APSL Scholarship Scheme, presented a detailed account of the progress made so far and the way forward for this project. During his presentation, several video clips of the recipient children were shown highlighting the positive effect that the scholarship scheme is having on the lives of these children. Mr Silva thanked all the sponsors and donors, and the APSL executive committee for supporting the scholarship scheme. During the Q & A session, the audience had the opportunity to raise questions and clarify any matters related to the scheme. The guests were treated to a very delicious buffet style dinner and the music was provided by the Sri Lankan Music Band Rhythm Brothers who kept the audience entertained with Sri Lankan Songs and Baila for everyone to enjoy a night of celebration and fundraising for a cause well worthy of supporting. APSL Executive Committee member Dr Dilirini De Silva did an excellent job in compeering the proceedings of the event. Finally, Dr Mohan Siriwardena the General Secretary of APSL proposing the vote of thanks, expressed APSL’s appreciation to everyone who supported for the success of the event. He extended his sincere appreciation to everyone who attended the event including sponsors of the scholarship scheme, the donors of the Raffle Prizes, Mr Ranjan Perera for conducting the Dutch Auction, Rhythm Brothers for providing the music, and Royal Nawaab, Manchester for the venue. He also thanked Newslanka and Sesatha Web for providing publicity for this event, and to the APSL executive committee and members for their contributions to make the event a success. Please visit www.apsl.org.uk for more details about APSL and its projects. The Annual Report of the Association of Professional Sri Lankans in the UK (APSL)for the year 2014-15, presented by Dr. Mahesh de Silva, General Secretary, during its11th Annual General Meeting, held on Saturday 23rd May 2015, at the Thistle Hotel, Bath Road, Longford, London, UB7 0EQ. APSL celebrated its 10th Anniversary in grand style with a Symposium and Dinner Dance held at the Grange City Hotel, London on 21st June 2014. The proceeds from this event was allocated to supply medical equipment to Anuradhapura Hospital which is at the forefront in providing relief and treatment for those suffering from Chronic Kidney Disease in Sri Lanka. The event was well attended by the members, their families and well-wishers. Prof. Terence Fernando, Prof. Shervanthi Hormer Vanniasinkam and Prof Chandra Wickramasinghe. In line with the theme of the Symposium the speakers gave highly inspirational accounts of how they were able to achieve such heights in their respective disciplines and the work they are currently engaged in their respective fields. A “Dutch Auction” conducted by Mr Ranjan Perera (a Vice President of APSL) and a raffle draw organised by Mrs Gayani Senaratne (Membership Secretary) helped raising significant amount of funds for the above cause. The members and their guests were treated to a sumptuous authentic Sri Lankan dinner followed by the dance to the music by ‘Sky High’. The APSL Scholarship Scheme was launched on Saturday the 25th October, at the Grange City Hotel, London attended by APSL members, their families and well-wishers. Professor Terrence Fernando, Director, ThinkLab, Salford University initiated the scholarship scheme through the Joseph Alfred Fund which provided financial support to 5 needy children from Moratuwa area at the launch. Prof. Fernando hopes the scholarship scheme will offer others like him in the UK and elsewhere the opportunity to make a difference in the lives of disadvantaged children to reach their full potential through education. Ten children currently receive monthly grants through the APSL Scholarship Scheme. The proceeds from this year’s Dinner dance is earmarked for the Scholarship Scheme. During his last visit to Sri Lanka, APSL President, Mr. Mervyn Silva and Membership Secretary Mrs. Gayani Senaratne visited Anuradhapura Hospital on 25th August and 28th October 2014 respectively and met with Dr. Rajeewa Dassanayake, his medical colleagues and nursing staff. The purpose of these visits were to hand over essential medical equipment worth over Rs. 400,000 bought with the funds raised during the 10th Anniversary Celebrations event. The visits also provided an opportunity to learn more about the scale of the problem as well as action being taken to treat those affected, as well as prevent the spread of CKD and explore how APSL may be of help in the future. Thanks to the donations from the APSL and other charities the vital medical equipment needed is now in place. 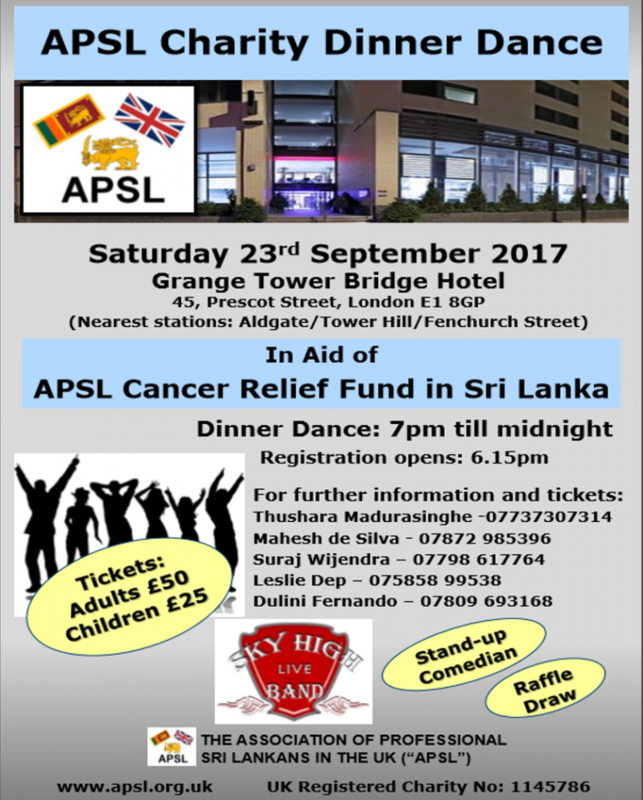 APSL would like to thank all the members and friends who attended the 10th anniversary dinner dance and supported this very worthy cause. APSL was a member of the organising team of the Tsunami Remembrance Event organised by the Sri Lanka High Commission on 26th January 2015 and took part in the photographic exhibition displaying the Tsunami re-building work carried out by APSL in Sri Lanka. APSL was also given the opportunity to deliver a speech on behalf the charities involved in the organisation of the event. As part of the APSL initiative for promoting knowledge transfer, the Young Professionals event was held at the Sri Lankan High Commission in London on 20th March 2015. This event was well attended by a mix of professional Sri Lankans, representing a range of expertise and experience. Three successful young Sri Lankan professionals based in the UK, Dr. Rajika Perera, Ms. Kanchana Ambagahawita, Dr. Dilrini De Silva , delivered speeches, on interesting and diverse topics, discussing their journey to success and aspects of their current work. A lively panel discussion and a Q&A session followed the three talks where the audience and speakers engaged in a dialogue about various emerging issues around developing professional careers, improving education in Sri Lanka and addressing social issues linked to education in Sri Lanka. The event concluded with an informal networking session over refreshments. Latest ‘Living in the UK’ series event was held on 17th May 2015 at Thames Buddhist Vihara, London. APSL Members Mr. Rohan De Alwis, Ms. Shiranee Joseph De Saram and Mr. Thushara Madurasinghe led an insightful discussion and talk to children and parents about preserving Sri Lankan values whilst living and integrating in the UK. A Pensions seminar organised by APSL was held on Saturday the 25th October 2014 at the Grange City Hotel, London. It was conducted by representatives from Holborn Assets and The Sovereign Group. The seminar covered the changes to UK pension regulations and the opportunities this offered. The event was well attended by APSL members and many non-members. Continuing its tradition for many years, APSL had a stall at the “Festival of Cricket” event held on 20th July 2014 in London. The stall was visited by a significant number of potential members and many of them joined the association. APSL will continue to take part in this event which is a great platform for the APSL to showcase its activities to the general public and to sign up new members to the association. Two Newsletters were published to coincide with 10th Anniversary celebrations event on June 2014 and 11th AGM and Dinner Dance on May 2015. New look APSL website was launched to coincide with the 10th Anniversary Celebrations event. The new web site is designed to be responsive, i.e. smartphone and tablet friendly and has many new features such as online membership application, PayPal payments and member only area. APSL would like to thank all the project leaders, their teams and all those who made presentations at above mentioned events for the tremendous work they have done to make the above events a very big success and also for maintaining the high standards created by the Association all these years. 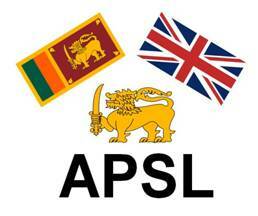 The Association of Professional Sri Lankans in the UK (APSL) held its 11th Annual General Meeting on Saturday 23rdMay 2015 at the Thistle Hotel, Bath Road, Longford, London, UB7 0EQ. It was a well attended meeting by the members of the Association. Dr. Mahesh de Silva, the General Secretary, presented his annual report giving in detail the projects and activities carried out by the Association during the year 2014 to 2015. The Treasurer Mr Thushara Madurasinghe presented the annual statement of Accounts for year 2014/2015emphasizingthe strong financial position of the association with a significant increase in donations to external charities and APSL charitable activities. At the election of office bearers, the following members were elected for the year 2015/2016. After two years as President, Mr. Mervyn Silva stepped down in keeping with APSL tradition of rotating its office bearers to give new members the opportunity to play an active part within the Association. Mr. Leslie Dep was elected as the new President for the coming year. The AGM was followed by the grand Dinner Dance to the music of the most popular band in the UK – “Sky High”. The proceedings of the Dinner Dance are to be allocated for the APSL Scholarship Scheme. The evening event began with the welcome address by the newly elected APSL President Mr Leslie Dep, who gave an account of the work carried out by APSL during the past year fulfilling the objectives of the association. Maintaining the theme of the event, the master of ceremonies Mr. Thushara Madhurasinghe (Treasurer) interviewed Mr.Mervyn Silva (Immediate Past President) and Prof. Terrance Fernando (Who initiated the scholarship scheme with Joseph Alfred Fund) on the details of the APSL Scholarship Scheme. The “Dutch Auction” conducted by Mr Ranjan Perera (a former Vice President of APSL) was highly entertaining with the participation of everyone for raising significant amount of funds for the above cause. In addition, the raffle draw organised by Mrs Gayani Senaratne (Membership Secretary) was also successful raising a record amount of funds. The highlight of the evening event was the Bridal catwalk. Models wearing traditional Sri Lankan bridal attire and wedding cake displays entertained the guests and provided an extra dimension to the event. The members and their guests were treated to a sumptuous authentic Sri Lankan dinner and special thanks go to “Sky High” for their beautiful lively music keeping everyone on toes until very late into the night. We also wish to thank the following local media for publicising the event adverts and also for their continuous support given to APSL throughout the year 2014-2015. Finally many thanks to the event organising committee Ms. Ruki Pinidiya, Mr. Thushara Madhurasinghe, Mr. Rohan de Alwis, Dr. Andrew Nayagam, Dr. Mahesh de Silva and Mr. Leslie Dep for all the hard work carried out with the fullest corporation and support from all other members of the executive committee to make this event a very big success in achieving the main objective of the event. During her recent visit to Sri Lanka, Mrs Gayani Senaratne, APSL Membership Secretary, visited Anuradhapura hospital accompanied by her husband Mr Upali Herath, on 28th October. The purpose of the visit was to deliver the remaining medical equipment that was not available for delivery during Mr Silva’s visit. Five digital blood pressure monitors. They spent about an hour being shown around the OPD (Out-patient Department) and wards and saw for themselves the multifunctional patient monitor donated by the APSL in use. During their visit they also saw a young man from Nuwara Eliya who had been a soldier stationed in Jaffna for several years seriously ill with CKD. They also saw a number of local children aged 15 -16 years who were affected by CKD, which now seems to be crossing the geographical and age boundaries. Thanks to the donations from the APSL and other charities the vital medical equipment needed is now in place. At the end of their visit Dr Rajeewa who was leaving for Medawachchiya to run his screening programme drew their attention to the next priority. Once discharged from hospital the patients need to attend the hospital twice a week to undergo monitoring and dialysis. While the government has promised to increase the monthly allowance given to patients from Rs 500 to to Rs 2000 per month when this would come into effect remains unclear. Finally, I would like to thank everyone – members and friends who attended our 10th anniversary dinner dance and through their generosity supported this very worthy cause. During his last visit to Sri Lanka, APSL President, Mr. Mervyn Silva, visited Anuradhapura Hospital on 25th August and met with Dr. Rajeewa Dassanayake, his medical colleagues and nursing staff. find out how APSL may be of help in the future. The hospital is faced with the serious situation of patients with kidney disease, presenting in ever increasing numbers. There are theories as to cause/s, but as yet no definite reasons have been found.It is possible that there are multifactual causes, rather than one main cause, making detection difficult. It appears that more females present in the early stages, and more males in the later stages of the disease. A study has shown a 22% infection in Badulla, 18% in Polonnaruwa and 15% in Anuradhapura. The epidemic appears to be more prevelant in low income families many with poor hygiene facilities and often social problems. The average household income among the dialysis patients was found to be Rs14,700 per month. Patients who are diagnosed to have reached advanced stages of kidney disease receive an allowance of Rs.500 per month from the government. The hospital has 4,000 registered patients and 4 satellite centres, staffed by junior doctors. The treatments carried out includes assessment in clinics, dialysis to clean the blood, and kidney transplants with follow up care. All treatment is free but the biggest cost to patients is in travelling to the hospital or clinics, which could be as much as half a households income. The first floor at the CKD Unit is the hemo-dialysis ward, the second floor has separate male and female inpatient wards, and the fourth floor is the peritoneal dialysis ward ( through the stomach). The transplant unit can treat up to 1 patient every 2 weeks with kidneys coming mainly from family members, some from monks for altruistic reasons and some from deceased people. According to Dr Rajeewa, one of the main problems for the hospital is facing is the low staffing levels. At the time of the visit, there were 6 doctors doing the work of an ideal number of 18, and therefore having to work extremely long hours, often doing a weeks work within one day! Also nursing staff numbers are low, ideally more trained nursing staff are needed. In spite of these difficulties, to their credit, amazing work is continually carried out, with only one complaint in 3 years!!! Because of the large numbers of patients attending the clinic, often as high as 130 – 140 per session, a more effective management system is needed, where information and possibly educational input is clearly and effectively displayed, so the whole assessment area can operate more efficiently and smoothly and increase the level of patient care that all staff are working so hard to achieve. The mulit functional monitoring machine donated during this visit was purchased with the funds raised at the APSL’s 10th anniversary dinner dance. They will enable the staff to monitor patients on the wards more accurately. As with all hospitals, there is an ongoing battle with infection and much work needs to be done in trying to educate and change peoples attitudes towards standards of hygiene. However, during the visit, the hospital appeared very clean, all credit to the wonderfully hard working staff. Mr. Silva thanked Dr. Rajeewa and staff for their warm welcome, for giving up their valuable time to show them around the hospital and for the detailed level of information which was shared.